Editor’s Note: The Greenway prides itself on being both a human- and dog-friendly park. 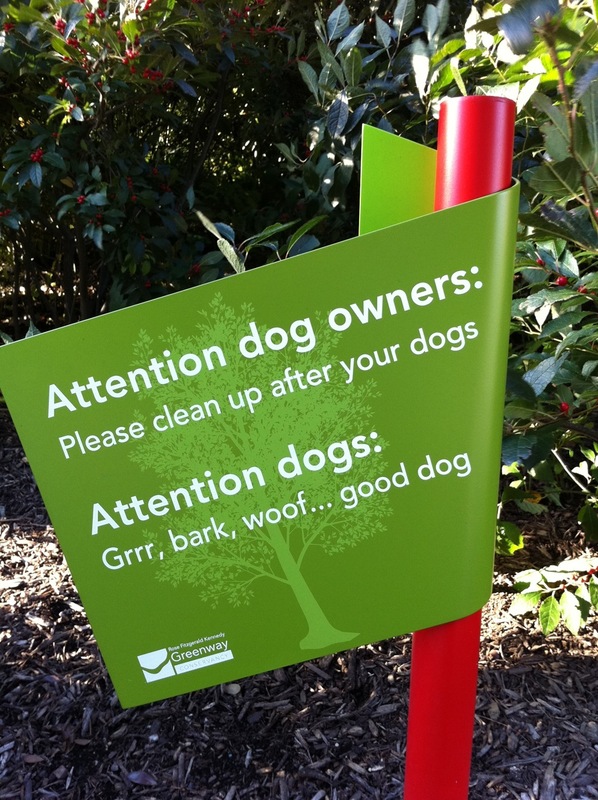 (We even have signage that speaks directly to our four-legged friends.) That said, we were pretty surprised to receive a note from one of our most regular visitors this summer, Noodles! But given that she sent it through our summer intern, Autumn, AND that it’s National Dog Day, we’re happy to share it with you! Even before her time volunteering with The Greenway it’s possible you saw us as we live in the Wharf District right next to the park! In fact, one of my earliest Greenway memories is of being hit by a car near Rowes Wharf Plaza (ouch!) in January 2014 only to have two wonderful Greenway employees rush Bartlett and I back to her car in one of their maintenance vehicles so she could take me to the hospital! I was thankfully back on all four paws in no time and was again prancing happily through the snow-covered Greenway! Now about me: I haven’t told you yet, but I am a golden retriever and love rolling in the soft, organic green lawns of The Greenway. My favorite part of being on The Greenway is meeting people from all over the world! I am a social dog, so it is always great to meet new people and these encounters led Bartlett and I to start a Facebook page called The Noodles Project to connect with all who we meet! What is this project you might ask? As a young and ambitious dog, I hope to connect the world through hugs! Just this summer I’ve posed for pictures with local residents and visitors from Metro Boston, states around the country, and tourists from England, Ireland, Finland, Bolivia, Canada, Armenia, Israel, and India! It’s a lot of fun to meet people from all over the world who visit The Greenway for a variety of reasons! So stop by The Greenway before the Echelman sculpture comes down at the end of October and you’re likely to spot me rolling in the grass. I might not have much to say, but I am always down for a hug! Leave a reply on "Noodles Checks-In on National Dog Day"